This is the snake that's threatening to eat the Everglades whole. The invasive species of all invasive species. The Burmese python, Python molurus. 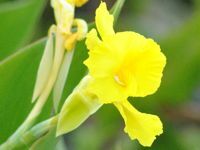 Invasive species by definition are nasty things, benign in their native range, but capable of doing great environmental damage in places where they don't belong. Burmese pythons are no exception. They eat anything and everything, with little to fear except us and alligators. But even gators — adult gators — can be a meal for a python. Burmese pythons, as the name implies, are natives of Southeast Asia, where they've been hunted to the point where their very existence is threatened. The irony is that a goodly portion of that is done for the pet trade, the same pet trade that's responsible for bringing them to Florida in the first place. 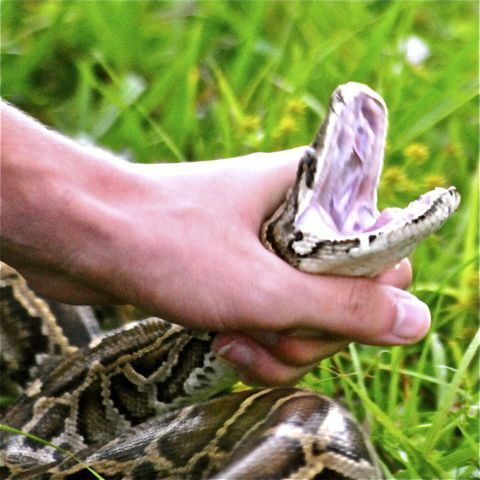 Pythons are popular as pets because of their relatively docile behavior, believe it or not. According to the National Park Service, 112,000 pythons were imported into the United States between 1990 and 2006. 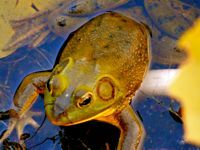 Now, they are federally listed as an "injurious species" under the Lacey Act and can't be imported into the country or transported across state lines. It's illegal to own one as a pet in Florida. 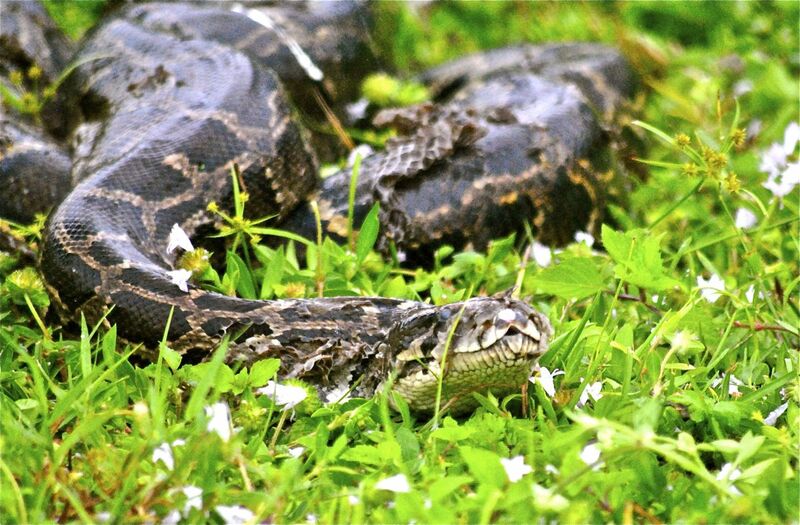 The Florida Fish and Wildlife Conservation Commission says pythons have called Florida home since the 1980s, dumped into the wild as unwanted pets or as escapees from captivity. Hurricane Andrew in 1992 might have contributed to their release by destroying a breeding facility and setting the resident pythons loose. 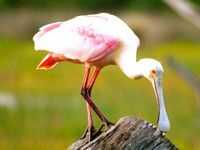 Scientists have long suspected they were breeding in the Everglades, because of the number of small hatchlings they found, but it took until 2006, when the first nests were discovered, to confirm it. 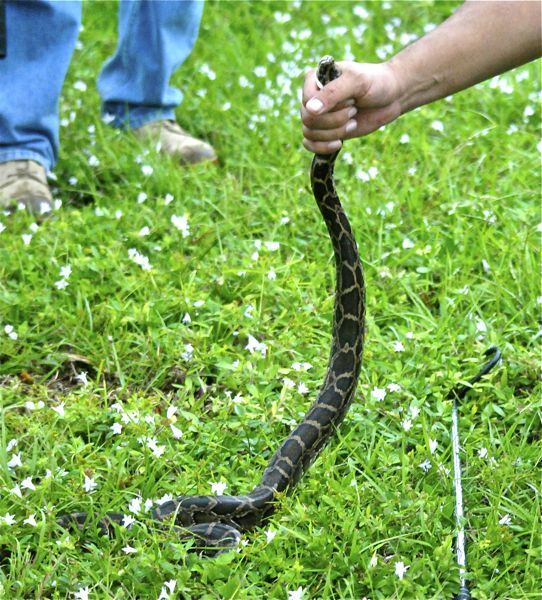 South Florida's subtropical climate and vast swaths of undeveloped land, particularly in Everglades National Park, make the region ideal territory for these snakes. Burmese pythons can exceed 20 feet in length, ranking them among the largest snakes in the world. In Florida, they average six to eight feet, but can reach two or three times that size. The state record, by the way, is 18 feet, eight inches. They grow rapidly — a 19-inch hatchling can reach five feet or more within a year. When they reach about 12 feet, they start putting on girth; the big guys can weigh as much as 200 pounds. 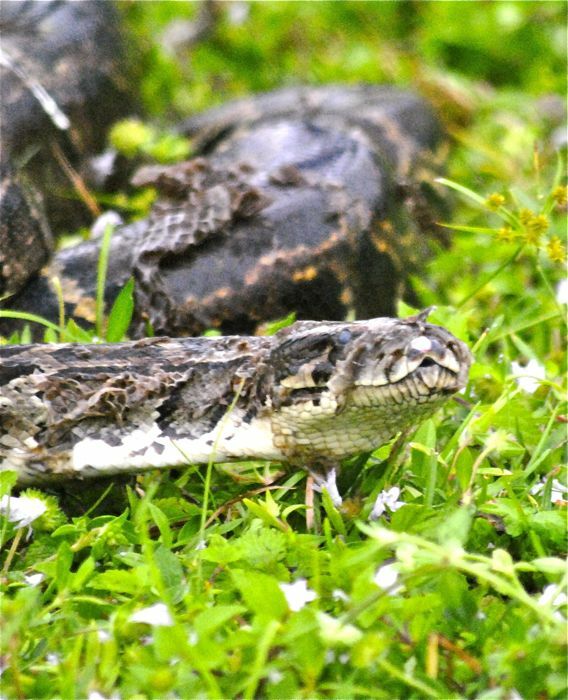 The largest concentration of Burmese pythons is in South Florida, particularly Collier, Miami-Dade and Monroe counties, but sightings have been reported as far north as the Panhandle. Burmese pythons have blotchy skin patterns in various shades of brown. Their bellies are white, with a row of small dark spots along each flank, and their heads are pyramid-shaped. One way of distinguishing them from other species is the way the blotches fit together almost like pieces of a puzzle. Other exotics have blotchy skin patterns, but the blotches are random and don't fit together the way they do on the Burmese. Some native snakes are mistaken for the Burmese, including the common and harmless corn snake (baby pythons!) and the venomous cottonmouth. The corn snake's skin has reds and oranges, and its pattern is banded rather than blotchy and really looks nothing like a python but many still confuse it with python hatchlings. The cottonmouth likewise has a pattern that's is less distinct than the python, its head is shaped differently and of course it has that cotton-white mouth. Burmese pythons are excellent swimmers and are often found along canal banks. That means water is no barrier to how far they can spread — they've already been found as far south as Key Largo. They also can climb trees. Early in the morning they tend to move into the open, where they can soak up some sun, particularly in winter. In the evening, they're often seen on roads or rocky outcroppings, again soaking up vital heat before sundown. They are masters at hiding — that's how they hunt, waiting for an unwary morsel to pass by, then quickly striking. They are not venomous, but rather constrictors, grabbing their prey with their mouth, then wrapping themselves around it and essentially suffocating it. 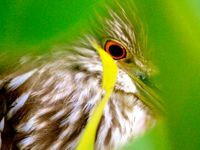 Prey could be almost anything, an endangered Key Largo woodrat or the threatened limpkin. White-tailed deer and adult alligators also are on the menu. A python will retreat if they spot a human approaching, but will fight if it feels trapped. Breeding season for the python is December through April. 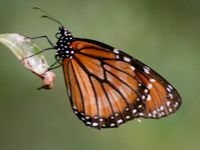 Males seek out receptive females, mate, then the couple go their separate ways. Females lay between one and three dozen eggs, which hatch between March and April. Mom remains with the eggs until they hatch, then leaves her offspring on their own. The damage they cause to the environment is multifold. They inhabit areas also occupied by numerous native species, some of which are endangered or threatened, and compete with them for food. They also can disturb nesting grounds to the point that birds will abandon them. Now multiply that by the thousands of pythons likely out in the wild and you get some idea of the threat they pose. Burmese pythons are also known as Indian pythons. They are members of Pythonidae, the python family. Note: the pythons shown on this page were photographed at Daggerwing Nature Center in Boca Raton during training for Python Challenge participants. They were captured pythons brought to the center by Florida Fish and Wildlife Conservation Commission employees.